Robometricschool. - Developing of robot technology in this time is very fast. Not only robot in industry, but also robot that used as game or toys. Like in transformer robot in the movie, real transformer robot realized as robot toys that building from remote control car or RC car. Kenji Ishida, that having hobbies to building transformer robot from japan realize transformer robot that build from RC car. Previous robot shaped transformers sedan into a robot like the one in the movie transformers. This transformer robot formed from RC car that change into transformer robot. So it is very nice to displayed. Kenji Ishida realize the transformer robot like in transformer robot in the movie. When shaped robot, the entire hand or foot function robot can function perfectly like a real robot as in the sci-fi genre films such. One again movement of this transformer robot can be operated use remote control. We can operate this robot to walk and dance use remote control. Kenji Ishida introduces transformer robot as robot transformer version 8th. 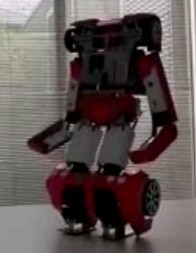 It is show us that this robot is not the first of Kenji's transformer robot. He has been improving this robot more than 4 years.